In the corner of the image is web address: davidicke.com. an important part in the final days and the return of Christ. The British Empire currently—and likely will for a long time—governs the Holy Land. movement, which posits that God’s chosen people are really white American Christians. Hence, the idea that there are false Jews. scholar Ernest Renan. Michael Barkun traces the subsequent development of this idea in his Religion and the Racist Right: The Origins of the Christian Identity Movement, an excellent and detailed book. 127), ushering in the idea of a tainted bloodline. which Jews would ascend to global hegemony. and genetics promises to add additional context to that history. In fact, modern genetics have already shed some light on the ancestry of the Ashkenazi. 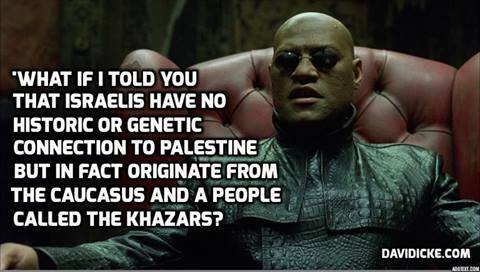 neighbors, who would presumably share the most genes with the historical Khazars (Yandel). from the Middle East (Fischman). embarked on a fourth career as a New Age guru who claims that the world is controlled by capitalist reptilian bloodlines. that the people they believe are imposter Jews are descended from the serpent in the Garden of Eden. social institutions. In Icke’s schema, everyone is a pawn, including the Jews. The scheming that he believes puts Khazars in Israel is not necessarily that of the Jews themselves, which… maybe?… makes it less racist? Maybe? Barkun, Michael. Religion and the Racist Right: The Origins of the Christian Identity Movement. University of North Carolina Press, 1996. Print. Elhaik, Eran. 2012. "The Missing Link of Jewish European Ancestry: Contrasting the Rhineland and the Khazarian Hypothesis." Genome Biology and Evolution 5: 61-74.